It is Spring time and it is time to clean out the house. After doing a little bit of decluttering around the house (get tips on decluttering), I like to have a yard sale. Might as well get a little something out of the decluttering work. So, how do you have a successful yard sale? Advertise: Get the word out that you have items people may want. Make sure to mention big items, such as: baby items, furniture, or if you have a large amount of collectibles. Make sure your address is clear. Make signs: Make signs or purchase signs to put up on street corners or poles to direct people to your sale. Make it easy for them to find you. Plus, this may catch a passer by who didn’t see your printed ad. Prepare: If you can, I find it is best to get things laid out the night before on the tables. Store the tables inside and move them out in the morning if you have to. If you have a garage, have the whole thing setup in your garage and just open the door in the morning. Enlist some help: It is nice to have someone there should you get swamped. Usually, first thing in the morning is the busiest. It also seems like everyone comes and goes at once, so that means everyone wanting to pay at once. It helps to have an extra person to process the checkout. Layout: How you have stuff laid out is key. Make sure you have similar items together. Example would be: Men’s clothes with Men’s clothes, Baby items with Baby items, etc. Also, make sure you have plenty of tables. You don’t want to have too tall of piles for people to go through. People will stop digging at some point. Straighten Items: After a swarm of people show up, usually the clothes are tossed all about and things totally mixed up. When it slows down, straighten things up. Re-fold the clothes and put them back neatly. Pricing: Remember, you WANT to get rid of items. Price them accordingly. Also, try to price things so they are easy to add up at checkout. To help make pricing faster, consider using sale stickers that already have a price printed on them. Have Plenty of Change: Most yard sales or garage sales will on the weekends. Most banks are not open past noon on Saturday’s. Make sure you have enough to get you through your sale. Be Open To Negotiation: People will always try to see if they can get an item cheaper. Be open to reasonable offers. Save your plastic bags: Before your sale, start keeping the plastic bags you get at the store. People will love it when you can offer them an easy way to carry out all their items. They will remember this and come back to any future sales you have. Have a plan for when the sale is over: What to do with the items that are left? I personally drive our items to a local donation site. Make sure to double check what they will take and what they will not. Some places will even pick up your items. 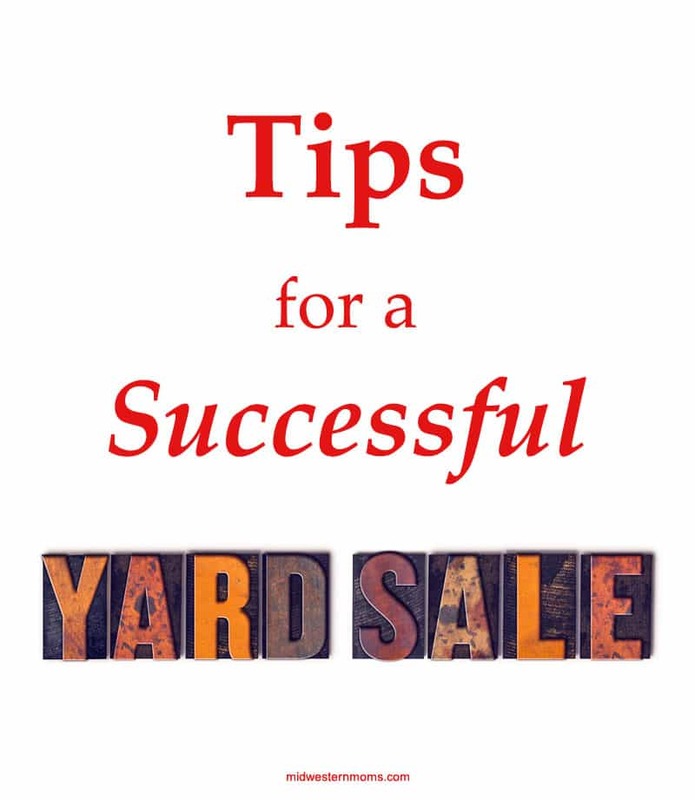 Now that you have all these great tips for a successful yard sale, go forth and get rid of your clutter! Have any other tips? Leave a comment and let us know.